It starts with an executive summary that highlights the most important information, and lists who all client and server operating systems, and other Microsoft products, are affected this month. Last but not least, it provides you with information on how to download the updates, direct links to major updates, and links to resources that provide you with additional information. Microsoft released 4 security bulletins in January 2017. 2 of the bulletins are rated critical, the highest severity rating. Vulnerabilities affect all client and server Windows versions that Microsoft supports with the exception of Windows 8.1 and Windows Server 2012 R2. Therefore, no Security Only Quality Update or Security Monthly Quality Update was released for these operating systems. Other Microsoft products for which updates were released include Microsoft Office, Internet Explorer, and Microsoft Edge. Only Windows 8.1, Windows 8.1 RT, and Windows 10 are affected by a critical vulnerability on the client side. The only server operating system affected by a vulnerability rated critically is Windows Server 2016. All are affected by MS17-003, a bulletin that patches Adobe Flash Player. That’s also the reason why Windows 7, Vista and Windows Server 2008, 2008 R2 and 2012 are not affected by the vulnerability. It is also interesting to note that Microsoft rates MS17-001 as important, even though Microsoft Edge on Windows 10 is affected by the vulnerability critically. A denial of service vulnerability exists in the way the Local Security Authority Subsystem Service (LSASS) handles authentication requests. An attacker who successfully exploited the vulnerability could cause a denial of service on the target system’s LSASS service, which triggers an automatic reboot of the system. The security update addresses the vulnerability by changing the way that LSASS handles specially crafted authentication requests. Microsoft releases individual patches for Windows Vista, and cumulative updates for Windows 7, Windows 8.1 and Windows 10. This means that options are limited when it comes to updating systems running Windows 7 or newer versions of Windows. Patches are provided via Windows Update. Please note that the full security and non-security rollup updates are provided through Windows Update, but not the security-only rollup updates. If you only want security updates, you have to download them from the Microsoft Update Catalog instead. Download links are provided in the next section below. Tap on the Windows-key on the keyboard, type Windows Update, and select the result of the same name. Click on the check for updates link on the page that opens if that is not done automatically. 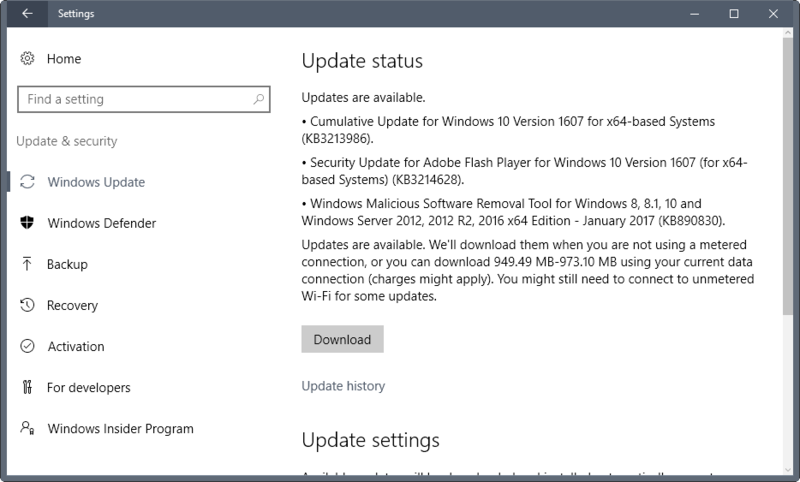 Updates are also made available on Microsoft’s Download Center and through the Microsoft Update Catalog. Microsoft stopped releasing monthly security releases in August 2016 apparently. This entry was posted on Wednesday, January 11th, 2017 at 12:31 pm	and is filed under General News. You can follow any responses to this entry through the RSS 2.0 feed. Both comments and pings are currently closed.